Ace fashion designer, Sabyasachi Mukherjee celebrates 20 years of his brand in April and it's time for us to join in his celebration. The designer will collaborate with Christian Louboutin to design a special collection 'Kashgaar Bazaar' to ring in his big day. While Bollywood beauties have previously sizzled and dazzled in his numerous designs, his craft has extended to celebs in the west including Oprah Winfrey and Sophie Turner. One of the finest designers in the industry today, Sabyasachi is a brand in himself and everyone wants to be associated with him in any way possible. 20 Years of Sabyasachi Mukherjee: From Deepika Padukone to Alia Bhatt, Taking a Look at Gorgeous Faces who Dazzled in his Stunning Creations - View Pics. To mark the 20th-anniversary celebration of his brand, Sabyasachi hosted a bash to unveil his new collection with the French band. 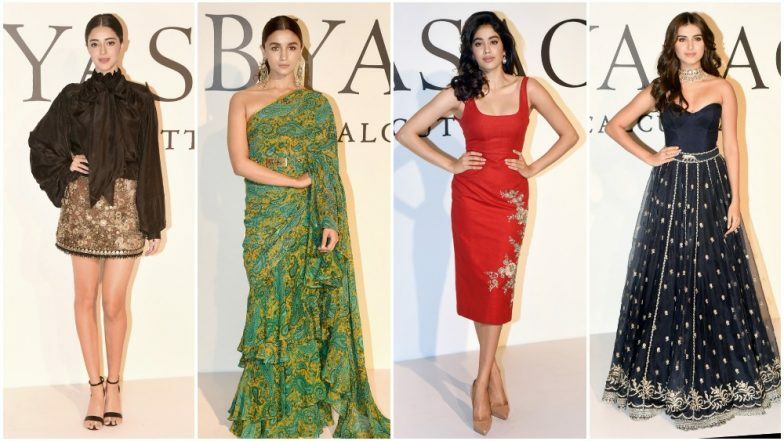 The gala affair was attended by many prominent names including Alia Bhatt, Janhvi Kapoor, Ananya Panday and Tara Sutaria. Let's have a look at their stunning pictures below. Priyanka Chopra's Sabyasachi Designed Bridal Outfit Gets Replicated Into a Four-Tiered Cake in London - View Pics. @faroutakhtar and @shibanidandekar with #sabyasachi for his show in mumbai tonight! We wonder if Sabyasachi Mukherjee's muse, Deepika Padukone, will arrive to grace his big bash. From ethnic drapes to chic dresses and exquisite jewellery, his artistic minds caters to different designs and is not restricted to mere attires. 20 years is a huge feat and accomplishing it, is an achievement in itself. Here's a raising a toast to this designer and a successful future that lies ahead of him.